As many of you know, I wrote an open letter to a Christian blogger. Yesterday, he posted his response. You’re welcome to read it. I’m sure he would appreciate the views. Please, make sure to leave him some love. He needs it. This is my final response the man who contributes to our culture of violence by using his own words as weapons. I received your response. Please allow me a minute to give my response back to you. I hope you’ll hear it. My message is important. And, like yours, my voice matters. I have many people that stand with me in the message I’m sending to you. That is what love can do! Why would I need to seek the attention of someone who is verbally abusive when I have the love of so many others lifting me up? However, you have made a point to bring all of your way, and look how respectfully we’ve responded to you! I guess that’s our love shining through. I wonder if you would act the same way and say the same things if Jesus stood in front of you. I bet not. You seem to believe because you speak with a swift tongue and line your words with passive aggressiveness and sarcasm, it makes you different from other bullies. 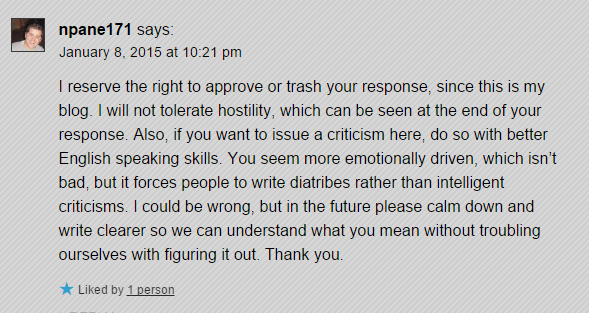 It forces people to write ‘diatribes’ rather than intelligent criticisms. A forceful and bitter verbal attack against someone or something. I also found it interesting that you mentioned you have the ability to delete and not publish or respond. Yet, you choose to publish and continue to tear people down. There’s a name for that kind of behavior: bullying. Which brings me to your next comment, where we see a diatribe written by you. To be honest, and I mean no offense, many of your articles are the exact same way. WordPress notified me that you had responded. My readers are important to me. So, I keep an eye on my blog traffic. I have no doubt that your blog is getting the most traffic you’ve ever had. Therefore, I understand why you’ve elected to respond a week later. You mentioned that I need to stick to your points and engage in debate with you or not comment at all or you would remove my comments. However, both of your posts clearly concern me and I see that you’ve elected to publish every comment I’ve made. Now, you responded. Be honest, you came looking for a fight. I’m sorry. You won’t find me debating any of your work. Your sources are unverifiable and based on opinion. Plus, as I mentioned before, it’s not my place to judge you or your views. Oh, how I wish someone had taught you! I can’t help but wonder if someone who speaks so much hatred and judgment been spoken to in the same manner and exposed to the same kind of hurt. You cause a lot of pain with your words, did you know that? You serve as a great example of what I mean when I say that we have a people problem and a culture of violence. There is no difference in causing a death because of one’s verbal abuse, rejection and judgment, and pulling a trigger and taking a life with a gun. Either way, life is lost. Do you know why I have no problem standing up to you? I stand for LeeLah Alcorn. You took the suicide of a child and you placed her before the public and cast your stones as hard as you could. After all, she’s no longer here to defend herself with a response to you. But I can and I did. Her voice matters. I’ll admit, I’m the greatest at biting my tongue, but at least my words are not used to attack, tear down and throw rocks. Faith should lift people up and give them hope. You sound like someone with no hope at all, if you ask me. I feel bad for you. I’ve used my words as weapons in the way that my you are throwing yours at me. We can be hurtful to others when we are in pain or have been hurt before. We guard our hearts and slam its doors. You seems to stand by your faults and you mock and insult to hide your true feelings of rejection, while making others feel the same rejection and pain that you do. You tear others down to build yourself up. Yes, you assault with your words. But does it work? Do you feel better? I bet you don’t. I would know. I’ve been there before. There’s no reason to use your words to destroy. Which is exactly what you have been doing. pain with your words. That kind of pain can go on to echo a very loud message long after the words roll off your tongue. LeeLah Alcorn showed us proof of that in a devastating and very powerful way. Everyone needs hope and something to keep them putting one foot in front of the other. Your faith (or recently proclaimed lack of it) and my faith are irrelevant when it comes to our hearts, words and actions. When you intentionally use your words as weapons, they fall out of your mouth as—trash. So, yes, I absolutely referred to them as such. I apologize if you offended you, but you should have composed your words better. Sometimes, holding your tongue is an act of love, too. Clearly, you struggle with that. It’s okay. I struggle, too. I don’t mind. Your words hurt my heart, not my love. So, if you must continue to come at me (and I’d prefer you stop), make sure to give it all you’ve got in round three! I like to feel my wins. Click here to send an open letter your friends and family. My thought? He clearly lacks the capacity to tolerate criticism. Stop giving him the attention he doesn’t deserve, simple! 🙂 No worries, dear friend! I simply used his public response to me to send a public message back into the world. It’s an important one. So, I’ll take any route necessary to spread it. However, this was my final letter to the Christian Blogger. People like that just remind me exactly why I was called to love. I’ll be echoing some of the love that poured in later this morning. I have a couple of things to say. The first is that the last time I looked we all had freedom of speech, whether it be to our liking or not. I’m finding hard to understand why you both are posting some kind of argument that you are having with each other. It surely doesn’t entertain, please me, or make me laugh. It does make me sad, so I pray for the both of you, that you either come to some kind of mutual understanding, or suffer from the consequences. And, by the way, you both have grammar and spelling issues. Hello, dear lady! I read your comment on my blog just now. Wow, what power our words can have! My mom spoke to me in the same way you spoke to me. She’d attack any flaw that she could to vent her own distress. It was hurtful and damaging . . when I was a child. So, I wanted to take a moment and visit your blog and leave some love. I love photography! This post make me think on my mother. It’s all of the orange. My mother has Multiple Sclerosis. Each year, I walk with the MS society for her. They use a lot of orange. This post speaks amazing loads of strength. I love it. I imagine …. I probably do have spelling errors and such, as you mentioned. I make no claim to perfection or a degree in English Composition. But I did check my post after reading your comment! I love when people point out corrections I’ve missed! I truly do. However, it contains not one spelling error. Perhaps, too much use of passive voice and one duplicated word. I made sure to fix that. It’s an important message and I was taught it in a difficult way. My voice matters, my grammar, not so much. See, the message you send others is important. In the same way that a child can post a public suicide note on social media networks and not have ONE hand reach out in concern. Yet, have a plethora of people similar to yourself, who will willing attack with their words. Words are a powerful thing. I see that you are a believer. The Bible speaks on the words that come out of our mouths. So, please, if you cannot build people up, at the very least DO NOT tear them down. I guess … that’s where you and I are different. But at least you spoke your mind and your voice IS important. Just remember . . . so is your message. My message is clear with this post and my response to you. There are enough people in the world casting stones.